Having great dental hygiene is an essential part of life, but sometimes when you come home too pooped at all to do anything else other than to flop on the bed, that is when the moment of weakness is the beginning of your cavity nightmare. Why not establish a routine of brushing your teeth regularly with the help of some technology? A simple toothbrush might not work, but when you hear the clarion call of the $189.95 Bacteria Eliminating Toothbrush, your ears might perk up as you take every opportunity to spend time with more technology. 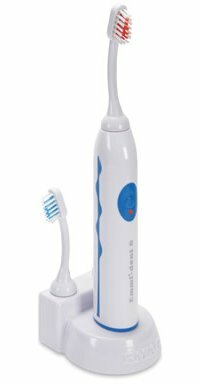 First of all, the Bacteria Eliminating Toothbrush has been described to be the only ultrasound toothbrush that is capable of killing bacteria instantly on the teeth, tongue, and even below the gumline. There is a microchip that is embedded within the toothbrush head to create safe ultrasonic impulses which help make short work of bacteria, doing away with the nasty germs that cause gingivitis, periodontitis, and bad breath. Each purchase comes with a couple of brush heads and a charging base to get you started.